Three years ago, when Grady was born, I made him a promise. One week ago, when Abby was born, I made the same promise to her: to read to her every night of her life, until she’s old enough to read on her own, and then we’ll read together — sometimes I’ll still read to her, sometimes she’ll read to me, and sometimes maybe we’ll just sit together and read quietly on our own. What’s important though, is that I promise always to make time to read to her, just as my father did for me. 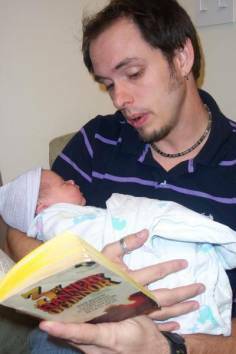 I considered for a long time what to read to her on her very first day in the world, and sought input from a variety of sources. I didn’t want it to be children’s literature — we’ll save that until she’s old enough to appreciate it. For our *very first* storytime, I wanted to share something with her that was literary, symbolic, and yes, written by a female writer that I’m passionate about. There are a few of those, mostly American writers from the south — I finally settled on Flannery O’Connor, who, like Steinbeck, weaves spiritual and philosophical themes into stories about common, rural folks. We read her short story The Displaced Person. In the week that followed, we’ve already covered a diverse landscape of literature and poetry, including Lord Byron (She walks in beauty like the night…), excerpts from both the Bible and the Dhammapada, and…just because she’s a Locke-child, after all, we’ve read the creation story from Tolkien’s Silmarillion.